A dental emergency is something serious that should be treated by a professional immediately. Overlooking a dental emergency can cause permanent damage and can result to be a more costly treatment the longer you wait. Here are several types of dental emergencies and how to handle each. Keep in mind that this article is not meant to treat or diagnose a dental emergency. Visit your dentist for a same-day appointment. Inflammation happens due to the immune systems reaction to an infection or allergen. Swelling can occur in the cheeks and gums. It is important to seek dental care as soon as possible since the inflation can spread to other parts of the face, mouth or jaw. Knocked out teeth are very common in adults and children, often caused by accident or through sports injuries. With a proper action plan, a tooth that has been knocked out of its socket can be saved and put back into place without the need for an implant. In the event of a dislodged tooth, pick up the fallen tooth carefully, only touching the crown and not the root to prevent injuring the tooth. If the tooth is dirty, rinse it with only water (do not use soap, scrub it or dry it). Try to place the tooth back into its socket with your fingers and hold it in place by biting down or using your fingers. If it is not possible to place it back into the socket hold it inside your mouth by your cheek, or place it in milk until you see a dentist. It is very important to see a dentist within an hour, the sooner you see a dentist the higher chances you have of saving your tooth. 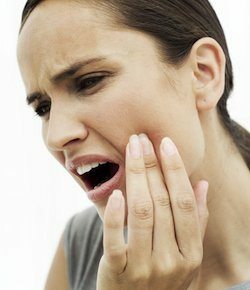 A toothache can cause horrible pain, difficulty eating, sleeping or concentrating, and should not be ignored. A sharp, constant or throbbing pain on a single tooth can be a sign that there is something wrong, it could be tooth decay, a cavity, or gum disease. It is important to reach for professional care as soon as possible to identify the cause of the pain so it can be addressed properly. Over the counter toothache pain killers will help alleviate pain for a short amount of time but the underlying cause of the pain will remain and will get worse as time progresses. If your tooth is broken, chipped, or cracked save any pieces and see your dentist as soon as possible. Rinse your mouth and any pieces with warm water. Apply a cold compress outside the affected area to relieve pain and keep the swelling down. If you are experiencing bleeding, apply a piece of gauze to the area until the bleeding stops. It is very important to seek professional care as soon as possible! There are several reasons why bleeding in the mouth can occur. Bleeding of the gums when brushing or flossing is an indication that there is a minor inflammation, a high amount of bacteria present, or food particles underneath the gums. We recommend that you read our article on how to floss properly as well as get a deep cleaning at your dentist office. If you bit your tongue, lip, or soft tissue in your mouth and it is bleeding excessively apply a cold compress to decrease the swelling, rinse your mouth with a mild salt-water solution, and hold a gauze or tea bag to apply pressure on the bleeding site for 15-20 minutes. If the bleeding continues, make a same-day appointment with your dentist and keep on applying pressure with the gauze or tea bag until you have been seen by a professional. If you experience damage to your braces contact your orthodontist right away. If there is a broken wire from a bracket or a band that is sticking out and poking your cheek, tongue, or gum we recommend you push it into a comfortable position and seek care from your orthodontist. If you cannot adjust it to a comfortable position try covering the wires end with a cotton ball, a piece of gauze, or orthodontic wax until you see your orthodontist. Refrain from cutting the wire because you might swallow it or breathe it into your lungs. If you have a loose band, save it and call your orthodontist to make an appointment to have it re-cemented or replaced. If your brackets are loose reattach them with orthodontic wax temporarily and see your orthodontist as soon as possible. When one of your fillings or crowns falls out that could be a sign that there is decay underneath. If you lose a crown or filling, call your dentist to make an appointment as soon as possible. The longer you wait the more damage your tooth can experience and your teeth might move in the space that the crown was. If you still have the crown and you are unable to get to your dentist that day slip the crown back in place and coat the inner surface with an over the counter cement to help temporarily keep it in place. If you are experiencing pain you can apply a small amount of clove oil to the sensitive area. If something is stuck in-between your teeth try using dental floss to remove the object. You can make knots in your floss to further help dislodge the object. If you cannot get the object out, see your dentist as soon as possible. Do not use sharp objects since it can cut your gums and damage the surface of your teeth. For objects that cannot be removed at home seek professional care from a dentist. If you experience a dental emergency come see us right away. We accept dental emergency walk-ins and we are open late. We offer convenient hours at 55+ dental office locations in Dallas, Houston, Fort Worth and more! Jefferson Dental accepts Medicaid, most PPO insurance plans, and offers patients with no insurance deep discounts on treatment through our Exclusive Dental Discount Plan.